A system created by MIT researchers aims to harness the full spectrum of available solar radiation; Princeton University researchers have developed a new method to increase the brightness, efficiency and clarity of LEDs. According to researchers at MIT, the key to creating a material that would be ideal for converting solar energy to heat is tuning the material’s spectrum of absorption just right: It should absorb virtually all wavelengths of light that reach Earth’s surface from the sun — but not much of the rest of the spectrum, since that would increase the energy that is reradiated by the material, and thus lost to the conversion process. And now, the MIT team says it has accomplished the development of a material that comes very close to the ideal for solar absorption. 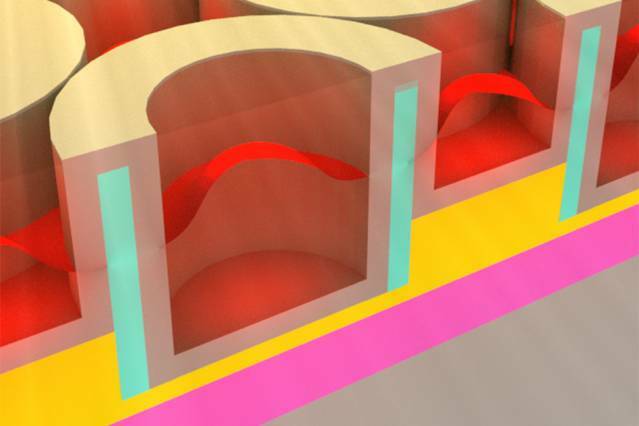 The material is a 2D metallic dielectric photonic crystal, and has the additional benefits of absorbing sunlight from a wide range of angles and withstanding extremely high temperatures, they said. Perhaps most importantly, the material can also be made cheaply at large scales. The material works as part of a solar-thermophotovoltaic (STPV) device in which the energy from sunlight is first converted to heat, which causes the material to glow, emitting light that can then be converted to an electric current. This rendering shows the metallic dielectric photonic crystal that stores solar energy as heat. The MIT team is now working to optimize the system with alternative metals, which they expect could be developed into a commercially-viable product within five years. Princeton University researchers have developed a new method to increase the brightness, efficiency and clarity of LEDs, which are widely used on smartphones and portable electronics as well as becoming increasingly common in lighting. Using a new nanoscale structure, the researchers increased the brightness and efficiency of LEDs made of organic materials (flexible carbon-based sheets) by 57 percent. The researchers believe their method should yield similar improvements in LEDs made in inorganic (silicon-based) materials used most commonly today. The method also improves the picture clarity of LED displays by 400 percent, compared with conventional approaches by inventing a technique that manipulates light on a scale smaller than a single wavelength. Current LEDs have design challenges. One of the biggest is to reduce the amount of light that gets trapped inside the LED’s structure. And although they are known for their efficiency, only a very small amount of light generated inside an LED actually escapes. In fact, a rudimentary LED emits only about 2 to 4 percent of the light it generates. The Princeton team’s solution is a nanotechnology structure called PlaCSH (plasmonic cavity with subwavelength hole-array) that reportedly increases the efficiency of light extraction to 60 percent — 57 percent higher than conventional high-end organic LEDs. At the same time, the researchers reported that PlaCSH increased the contrast (clarity in ambient light) by 400 percent. The higher brightness also relieves the heating problem caused by the light trapped in standard LEDs. PlaCSH is able to achieve these results because its nanometer-scale, metallic structures are able to manipulate light in a way that bulk material or non-metallic nanostructures cannot, the researchers said.